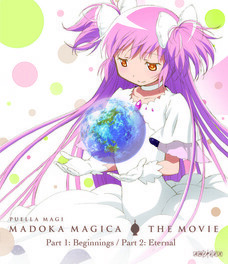 This Puella Magi Madoka Magica movie set contains the first two movies. Madoka Kaname is an eighth-grader who leads a peaceful, fun-filled life as a student, surrounded by her beloved family and her best friends. One day, a transfer student named Homura Akemi arrives in Madoka's class. She is a dark-haired beauty with a somewhat mysterious disposition. Soon after meeting Madoka for the first time, Homura goes on to issue Madoka a strange warning. Special Features: Textless Opening and Ending, Theatrical Trailers, TV CM Collections. Spoken Languages: English, Japanese with English and Spanish subtitles.